The MP 6600 is designed for ceramic tile removal high volume. Using a high-flow skid steer this attachment removes tile in an 18” wide-cut path. The MP 6600 moves most of the thin set along with the ceramic tile. The unit also removes concrete underlayment at prescribed depth. The in-cab operator controls provide side-shift, angle cut and depth of cut. For dust control, the unit will grind wet or dry. The 1,500 lbs. of downforce allows for up to 1,000 sq. ft. of the tile removal per hour. The MP 6600 attachment is designed for ceramic tile and underlayment removal in large areas, where skid steer machines can work on long runs. Typical jobsites are shopping malls, warehouses, airplane hangars and stadium walkways. Average jobsites are 10,000 sq. ft. and up. 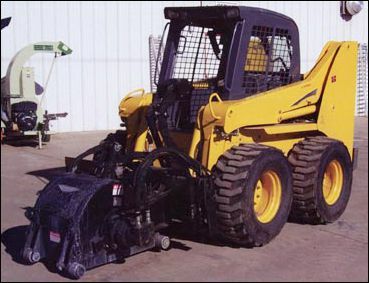 Current ultra-low emission Tier 4 engines in skid steer machines allow for more applications in well ventilated areas. MP 6600 also removes high build epoxy coatings found in bridge decks. As a primary removal tool, it works in conjunction with riding floor scrapers and industrial diamond grinders, to remove bulk coatings and save on costly diamond consumables. Surface coating removal cost are greatly reduced on large projects by minimizing labor with this single-operator unit. The carbide cutters are long lasting when compared to all other removal methods. Maintenance of the MP 6600 is performed with standard tools. A carbide tip extractor tool is included with the attachment. Basic daily lubrication promotes long trouble operation cycles.